Place the game board in the middle of the table with the victory point chips and artefact tiles nearby. Each player selects a color, takes the 5 figures in this color and places them before himself (his play area). Shuffle the 25 event tiles face-down and place them randomly on the spaces marked for them on the game board. After they are placed, turn them face-up. Shuffle the cards face-down and deal 8 cards face-down to each player. Place the remaining cards face-down as a supply next to the board. Note: When playing with two: before dealing the cards, remove 30 cards randomly from the deck and place them face-down back in the box. 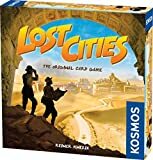 The game consists of 3 expeditions. After each expedition, the players score their positions. After the 3rd expedition, players also score the artefacts they have collected during the game. 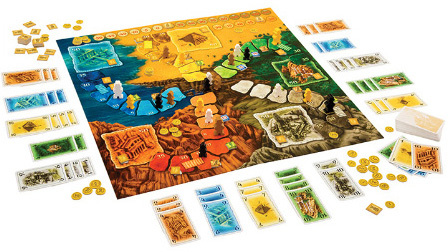 The players choose a starting player who begins the first expedition. or discard the card (face-up on a discard pile). from one of the face-up discard piles. The player chooses one of the card colors in his hand and places the card with the lowest value in this color face-up in his play area. Only he may later place cards on this card. Then, the player chooses one of his figures and places it on the first space of the path (-20) of the same color as the card played. The -20 value means that this figure's score, at this moment is 20 minus points. Important: the researcher earns the player double points at the end of the game: either plus or minus. Note: each player may only begin one search per color. Of course, several players may have searches on the same path (e.g. 3 players each begin a search on the blue path). The player decides which of his paths he wants to explore and move forward on. He chooses a card of the color of this path from his hand and places it on a card of this color already laying in his play area. The new card must have the same value or a higher value than the card it is played on. Then the player moves his figure on this path one step further. Note: if an event tile is on the step he reaches, he finds the event. When a figure of a player reaches the last (ninth) step, and the player plays a (valid) card for this path, then he may move any of his other figures one step forward on the path it is on. The player chooses one of his hand cards and places it face up next to board. During the game, players are likely to discard many cards. The cards are separated by color (at most 5 stacks) with only the last card discarded per color showing on its stack. Note: as the game proceeds, a player often collects cards which he cannot use and can, therefore be discarded. When a player, for example has played a red 4 and a red 7, and then draws a red 3, he will want to discard this card! However, he may want to wait until no other player can use this card. Once the player has completed this phase, he can go on to Draw a card. He draws the top-most card from the face-down supply. He draws the top-most card from one of the face-up discard piles. Now, the player has again 8 cards in his hand and his turn is over. Now, the next player, in clockwise order, takes his turn and starts by playing or discarding a card from his hand. 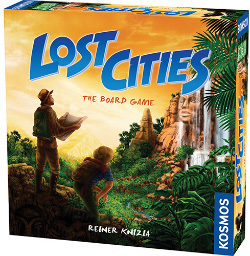 The player takes the artefact tile from the board and places it in his play area. The tile space remains empty! The player takes victory point chips in the value shown on the tile and places them face-down in his play area. The researcher does not take double points. Victory point chips are always placed face-down. The tile remains face-up on the space. The player may move any of his figures, that is already on a path, one step forward. If this moved figure reaches a space with an event tile, the player executes the action indicated on that tile, and so on. The tile remains face-up on the space. An expedition ends immediately when a total of fi ve figures pass a bridge (between the 6th and 7th steps on each path). This does not mean that every bridge on every path was passed. It is possible that on one path two players pass the bridge and on another none pass the bridge. If one reaches a space which ends the expedition and it has an event tile, the action indicated by the tile is not executed. An expedition also ends, when the last card from the face-down supply is drawn. 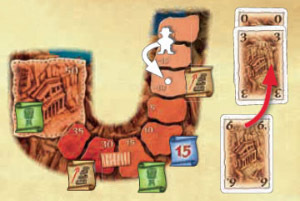 Each adventurer earns the player as many points as shown on the space where he is standing. Each researcher brings the player double the points shown on the space where he is standing. The points are paid to the players using the victory point chips. If a space shows negative points, the player must give up that many victory points in chips. No player can have fewer than zero points. Next, the players take back their figures. Each player, who has artifact tiles, must return these. For each tile a player has, he takes a square artifact chip, which he places in his play area. After the scoring is complete, shuffl e all 25 event tiles as at the beginning of the game and place them again, randomly, on the spaces marked for them on the board and turn them over. The players keep their victory point chips and their artefact chips. 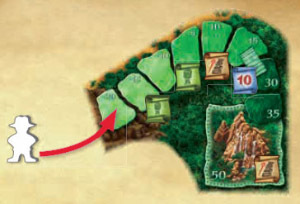 The new expedition begins with the player to the left of the player who played last in the previous expedition. The game ends after the scoring of the third expedition. Now players count their artefact chips. In the long scoring table on the game board, players can read how many points they earn for their artefact chips. A player with fewer than 6 artefact chips will lose victory points. Each player now adds now the value of his victory point chips. The player with the most points wins. If players tie with the most points, the player among them with the most artefact chips is the winner.